The 1965 and early 1966 GT350 Mustang Shelbys received Koni shocks as part of the "Shelby Conversion" at Shelby American. It was quickly discovered by Shelby that a longer bolt and bigger bolt head would work much better for the top mounting of the front Koni shocks. 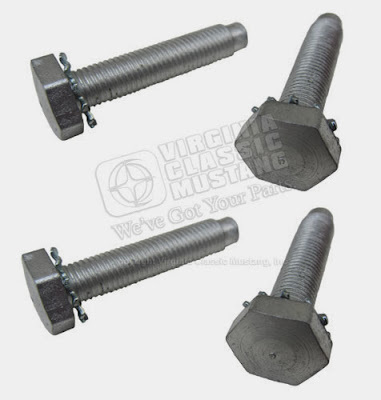 A rather unique looking bolt was used, and we now have it available as a reproduction. They are sold in sets of 4 to mount the tops of both front shocks. They are the original size - 5/16 inch - 24 x 1.60 inch long and feature the correct, unique 9/16 inch hex head with slight dome. The tip of the bolt is an unthreaded bull nose like the original. These bolts also come with a separate star washer and feature a silver cadmium plated finish, again, just like the originals. Our part number is PE-8511 - click on the part number or picture to order.